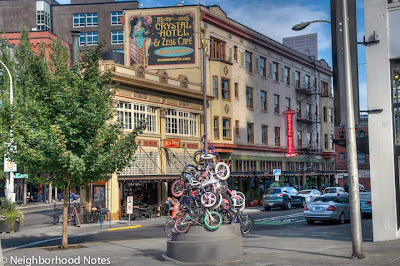 I finished 2013 contributing some neighborhood, event and business blurbs to Neighborhood Notes, helping supplement our updated neighborhood and business district guides for West End, Mississippi, Alberta, Sellwood-Moreland, and the Pearl District. I wrote the main 'hood descriptions for all of the aforementioned (except the Pearl) and highlighted shops like Tender Loving Empire (West End) and Powell's (Pearl), Mississippi Ave. events like the summer street fair, 2nd Thursdays and Cirque du Cycling, music venues like the Crystal Ballroom and Al's Den in the Crystal Hotel (West End), and Pearl places and happenings like First Thursday, the Museum of Contemporary Craft, and Portland Center Stage and The Armory. My contribution to this week's edition of Get Out! In what's become a holiday tradition at the Alberta Rose, the White Album Christmas returns for its sixth year of doing what Portland does best. 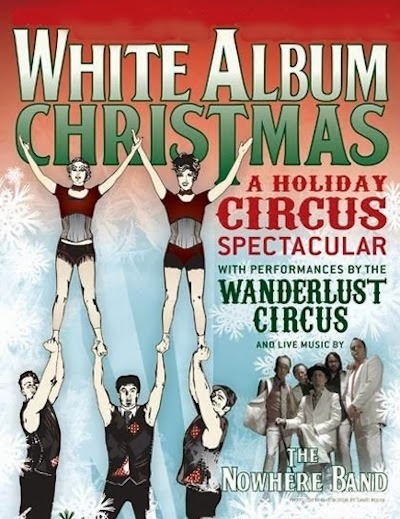 Prepare for a Liverpudlian Christmas carnival spectacular featuring a menagerie of amazing PDX players (aka The Nowhere Band, which includes members of MarchFourth Marching Band, The Stolen Sweets, The Saloon Ensemble, Solovox, Trashcan Joe and more) performing the classic Beatles masterpiece from front to back with eye candy (like juggling, acrobatics, aerialism and dancing) provided by Wanderlust Circus, all backed by horns and strings and surprises! Get your tickets now because they're going fast—several evenings have already sold out but a Saturday family matinee (2pm show) has been added. Check out the rest of OMN's Get Out! picks for December 5 to 11.